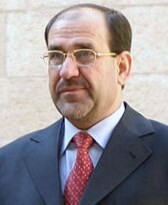 Iraqi prime minister Nuri Kamal al-Maliki. A ruling in January by Iraq's highest court — sought by Mr. Maliki — gave him control of once independent agencies responsible for running the country's central bank, conducting elections and investigating corruption. A month after that ruling, two leading human rights groups said that forces that reported directly to Mr. Maliki, in violation of the country's Constitution, were running secret jails where detainees had been tortured. And in July, Iraq's high court ruled that members of Parliament no longer had the power to propose legislation. Instead, all new laws would have to be proposed by Mr. Maliki's cabinet or the president and then passed to the Parliament for a vote. Political experts said they knew of no other parliamentary democracy that had such restrictions. Must U.S. Taxpayers Pay for Iraqi Electricity?